They are made for the fastening, to fix and to seal, once sluices they can’t be re-opened. They are particularly suitable for electrical wirings where is necessary to hold united or to fix the cables, moreover are useful in all the situations where they must be used as a not re-opening string. absorption humidity 2,7% (in exposure to the air with 50% of U.R. 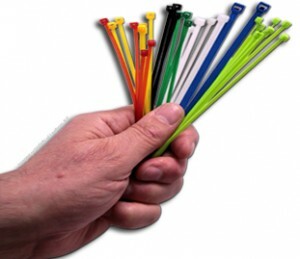 We use classified material UL94V2 For all the polyamide 66 cable ties. It resists to bases oils, greases, soaps, detergents, petroliferous products, clorura dissolvents, alcooli. – Limited held to acids.